Comments Off on What’s in Bloom: I didn’t know you could grow that here?! 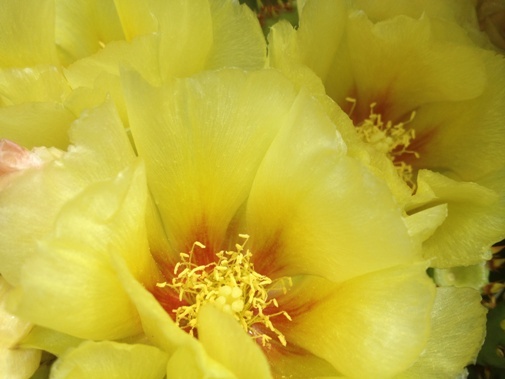 When the opuntia are in bloom the most-heard comment in the garden is ‘I didn’t know you could grow that here? !’ Opuntia ‘Lemon Spreader’ (Lemon Spreader prickly pear cactus), along with the entire TBG opuntia collection, can be found in the Terrace Garden, west-facing. 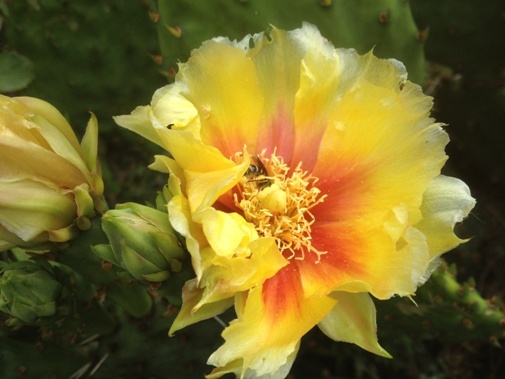 Opuntia fragilis (brittle, or little, prickly pear) is native to most of North America and many Canadian provinces. 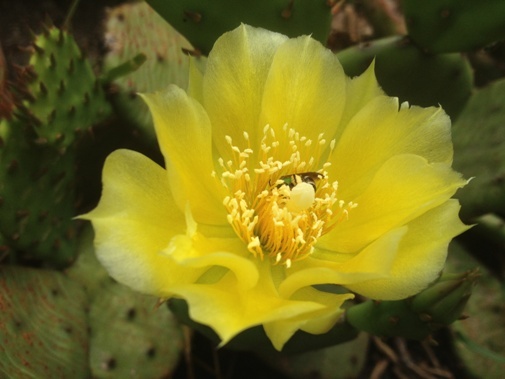 Opuntia humifusa (prickly pear cactus, devil’s tongue, low or smooth prickly pear) is native throughout Ontario. 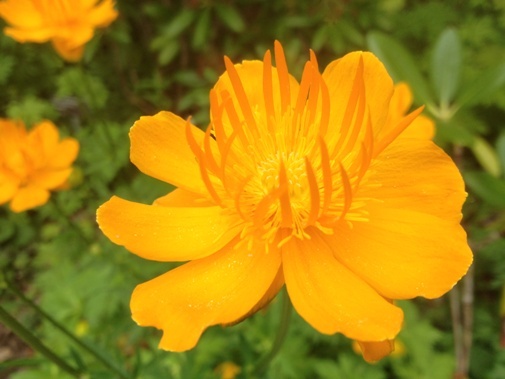 Many of our trollius are coming into flower. In the Garden Hall Courtyard, on the bank is Trollius chinensis ‘Golden Queen’ (globeflower), offset in the background by Actaea simplex ‘Hillside Black Beauty’ (black bugbane). 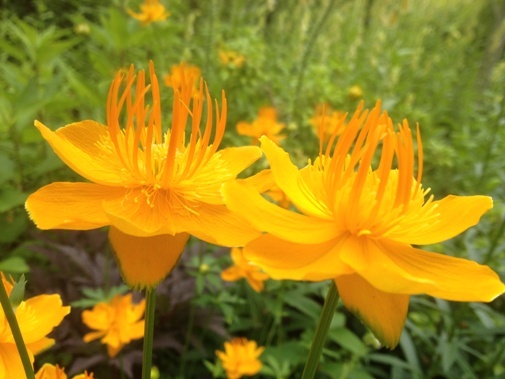 On the opposite south side of the Garden Hall Courtyard, Trollius x cultorum ‘Pritchard’s Giant’ (globeflower) bears large orange-yellow flowers. 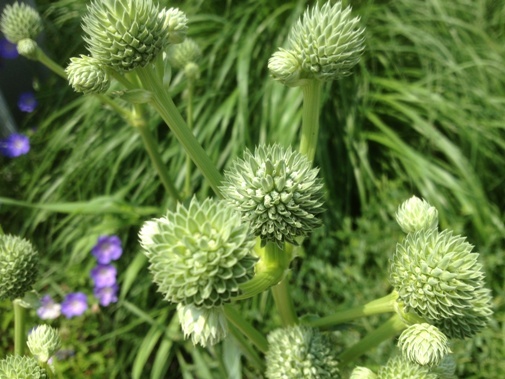 Eryngium yuccifolium (rattlesnake master) throughout the Entry Garden, has greenish-white flower-bracts. A member of the parsley/carrot family common to tallgrass prairie habitats. 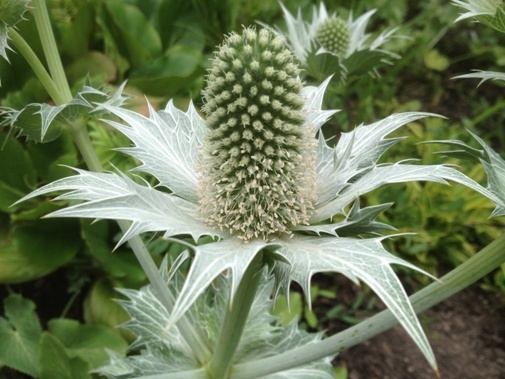 Eryngium giganteum (Miss Willmott’s Ghost, sea holly) has a prominent cone of small flowers surrounded by spikey bracts. Self-seeds readily, and does so freely in the Garden Hall Courtyard along the water channel. 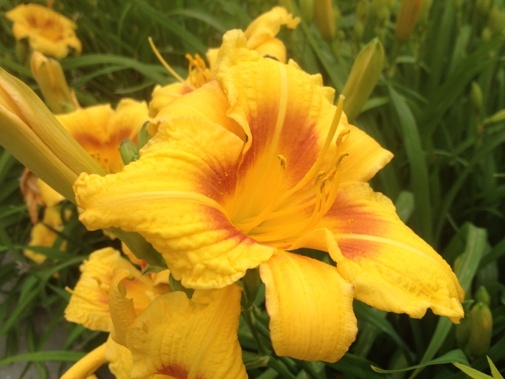 Accompanying Miss Willmott’s Ghost along the water channel is Hemerocallis ‘Black-Eyed Susan’ (daylily) with lightly crimped petal edges, an excellent rebloomer for northern gardens. 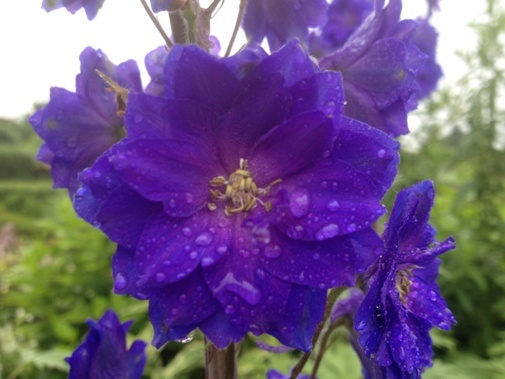 Delphinium ‘Sunny Skies’ (New Millennium Series Delphinium) is known for rich shades of pale to deep sky blue, with a white bee. 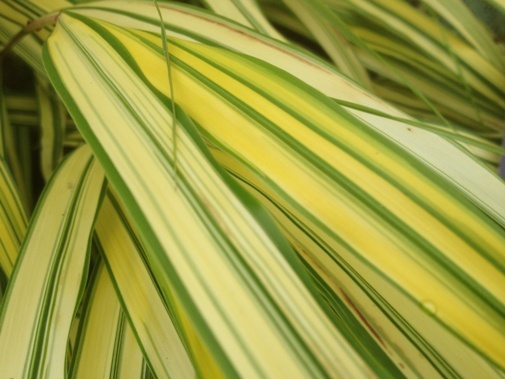 And to offset all these beautiful flowers, Hakonechloa macra ‘Aureola’ (variegated Japanese forest grass) on the bank of the Garden Hall Courtyard. This grass is reliably clumping and great for tough-to-grow areas, such as under trees, sun or shade.